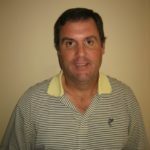 Within the gates of University Park Country Club in Sarasota FL sits 27 holes of championship golf that will test even the best of players. Each layout was designed by Ron Garl and can be played in three different combinations, offering members a wide variety of golf holes. A community that was once referred to by the Association of Home Builders as the “Best Community Design in America” deserves a great golf course and Garl certainly delivers. Garl used whatever the topography of the land gave him and carved a beautiful golf course from the woodlands and natural habitat. 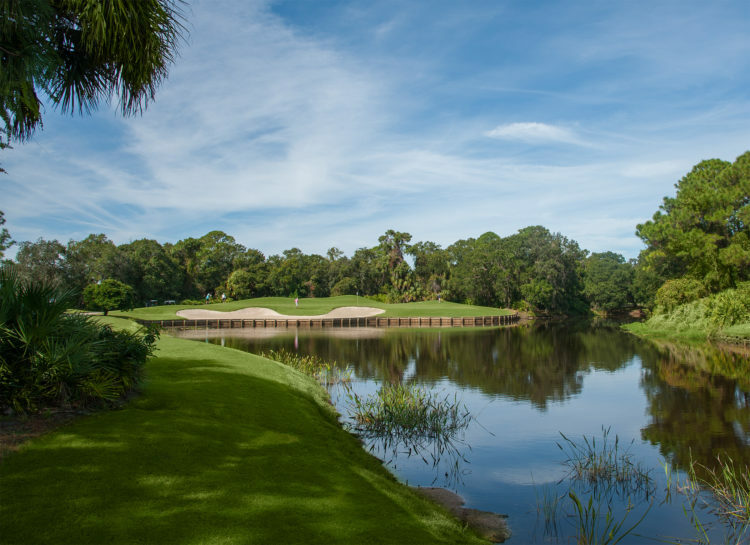 Many of the holes feature fairways lined with trees and natural Florida vegetation and only a couple do not offer wide, ample landing areas off the tee. Although water is visible on a number of holes, it really only comes into play on 12 or so. Some holes require an easy forced carry over water or wetlands that shouldn’t pose a problem to any golfer – provided you’re playing the right set of tees. Holes 10-18 are roughly the same length as 1-9 (3,456 from the Diamond, 3,072 from the Platinum and 2,481 for then ladies), with water factoring into the equation on all but two holes (13 and 14). This side starts out with a somewhat short par 4 – 342 yards from the Platinum tees – but don’t let that fool you. Although the fairway opens up to the right just past the trees, there’s a pond lurking over there. If you can favor the left side off the tee, you’ll be left with a medium to short iron into a wide green. With the green sloping form back to front, try to keep your approach shot below the pin to have the best shot at birdie. Hole Number 26 is a challenging par 5. Although water doesn’t – or at least shouldn’t -come into play, what it lacks in water, it makes up for in sand. You’ll need to avoid the fairway bunkers on the right off the tee; longball hitters may have an opportunity to go for the green in two. If you find yourself having to layup, there’s a series of three bunkers about 100 yards short of the green in the middle of the fairway. The green is best approached from the left side. For those trying to reach in two, take dead aim straight over the fairway bunkers. Last Word: University Park Country Club offer six sets of tees, so that anyone – regardless of their skill level – can enjoy the course. There’s a large, full-length driving range where players can hit every club in their bag, a great short game area and a large practice green where you can groove your putting stroke before heading out on the course. Inside the clubhouse, University Park’s pro shop is stocked with all of your favorite logoed golf apparel from designers such as Fairway & Green, Tehama, Cutter and Buck and Jamie Sadock, as well as equipment from some of the biggest brands in the game. You’ll find them competitively priced with the big box retailers. Another thing that sets University Park apart is their culinary staff. Executive Chef Roger Turtch has plenty of experience at high end private country clubs and his highly trained team uses only the freshest ingredients, prime meats, fish and poultry to create dining experiences unlike anything you’ve had before. Club members and visitors to the facility are invited to enjoy lunch at The Park Grille & Café, Monday – Saturday between 11:30 am and 2:30 pm. Their vast menu includes mouthwatering burgers and sandwiches, homemade soups and gourmet salads that are anything but typical. Dinner is reserved for members and their guests.